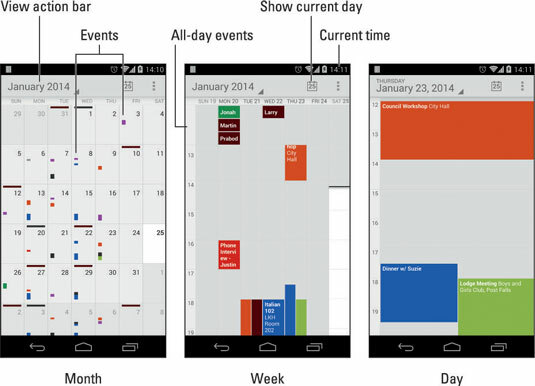 The ideal datebook and appointment calendar is the Calendar app on your Android phone. Combined with the Google Calendar feature on the Internet, you can manage all your scheduling right on your Android phone. It’s almost cinchy. The figure shows the Calendar app’s three views: month, week, and day. They look subtly different in horizontal orientation, but it’s the same information. Not shown is the agenda view, which displays only upcoming events. Each view is chosen from the View action bar, illustrated in the figure. Use month view to see an overview of what’s going on, and use week or day view to see your appointments. Check the week view at the start of the week to remind you of what’s coming up. To scroll from month to month, swipe the screen up or down. In week view and day view, scroll from left to right. Touch the Today icon to be instantly whisked back to the current day. The current day is highlighted in month and week view. A horizontal bar marks the current time (refer to week view in the figure). Different colors flag your events. The colors represent a calendar category to which the events are assigned.